Ant species can differ widely in their food requirements and behaviors. It is important to identify the type of ant before choosing a treatment. Once you've identified the key features, final identification is made from size, color, other body characteristics, habits, or other information. 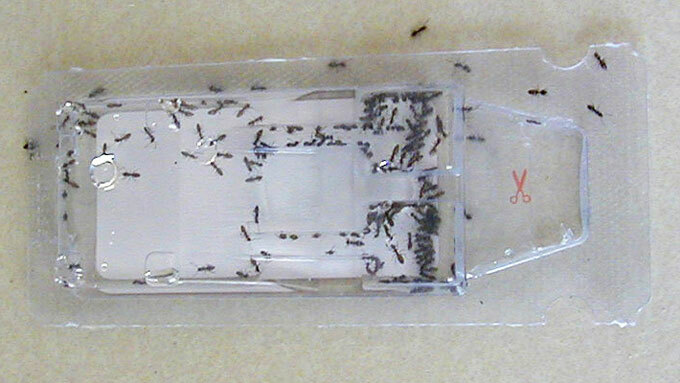 To help identify ants, they are grouped into "one node" and "two node" ants. The "nodes" are an important identification characteristic. (see graphic below). To Identify Ants - Learn the Key Features. In order to see key identifying features on ants - especially very tiny ants - you need a hand lens or microscope. Like other insects, ant bodies are divided into head, thorax, and abdomen. Ants also have a constriction between the thorax and abdomen that gives them a "pinched-waist" appearance. The constricted part of the abdomen is called the pedicel, and the fat, main part of the abdomen is called the gaster.